Turn your next girls&apos; night out into a girlfriend getaway to Greater Madison! Grab your bestie, find a hotel you&apos;ll both love and start planning a weekend adventure today! Breweries, wineries, and spirits are part of Wisconsin&apos;s heritage and you&apos;ll find award-winning options in all directions. Between wine tasting rooms, brewery tours and local distilleries, there&apos;s something for every taste. Start with a tour of beautiful Wollersheim Winery, located in nearby Prairie du Sac and overlooking the Wisconsin River. Old Sugar Distillery is a fun hangout, and THE place to try a specialty cocktail that uses local ingredients. For relaxation, slip into a robe and try a spa day in the city or the countryside. Sundara Inn and Spa is nestled in 26 acres of pines, and Indulge Spa is right here in Madison. Both provide a perfect way to relax and give your body a break, with massage, skin treatments and nail care. The Edgewater Spa, located next to the historic Edgewater hotel, also has a full-service menu and you don&apos;t need to be a hotel guest to use their services. 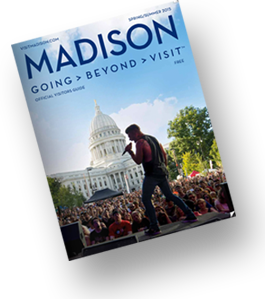 There are countless ways to explore Madison&apos;s natural beauty. Get started at the amazing UW-Madison Arboretum, which locals often suggest is the best place to run, walk or snowshoe because of its long routes and beautifully serene setting. A stroll down Lakeshore Path to Picnic Point is also a favorite because of it&apos;s scenic views of UW-Madison campus and Lake Mendota, the city&apos;s largest lake. Or explore the second largest lake by looping Lake Monona by bike or foot. The entire loop is a 20k, and will take you through neighborhoods and parks. Hilldale Shopping Center: an upscale, outdoor shopping center with stores like Free People, Anthropologie, Lululemon and Sur la Table. Greenway Station: an adorable outdoor shopping mecca, with great, well-known stores like Loft, Chico&apos;s, DSW, and J. Jill. There are also several eateries, including a hibachi and sushi restaurant called Fuji. East Towne Mall: rests in the center of a large retail area with numerous restaurants and big-box stores, including a large Barnes and Noble. West Towne Mall: 110 stores, including J. Crew and Ann Taylor, plus the mall recently added The Cheesecake Factory.